The neighborhood is accessible only through two main entrances. The people in Christiania have developed their own set of rules, completely independent of the Danish government. Having No cars, No stealing, No Guns, No Bulletproof Vests, and No Hard Drugs. The community rules clearly says that marijuana is cool...but hard drugs (heroin and cocaine) are absolutely forbidden. Famous for its main drag, known as Pusher Street, where hashish (often shortened to hash) was sold openly from permanent stands until January 4, 2004, the stands were finally demolished by the owners themselves (without stopping the hash trade as such, which continued on a person-to-person basis) as a way of persuading the government to allow the Free Town to continue to exist. The region negotiated an arrangement with the Danish defense ministry (which still owns the land) in 1995, and the residents now pay taxes. The future of the area remains in doubt, though, as Danish authorities continue to push for its removal. On Pusher Street, cameras are not allowed, and locals will wave their hands and shout "No photo!" if they see someone trying to take a picture. 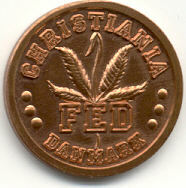 If you're looking for Christiania coins, you can directly contact Vagn Sorento Dichman (for "Fed" issues) and Ditlev Nissen (for "Løn" issues). Fed coins were issues in 1976-1977, 1981, 1984-1985, 1988, 1993 and 1997-2006. Klump were issued in 1991 only. 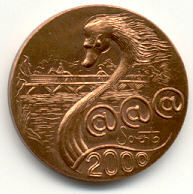 Løn were issued in 1997-2008. 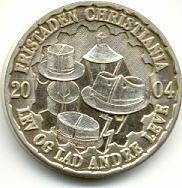 Christiania also has some anniversary-ralated medallic and exonumia, bearing the words "aar" in 1977, "år" in 1981 and 1991. These feature its 06th, 10th and 20th anniversaries respectively. In 1996 special issues were also made to celebrate their 25th anniversary. 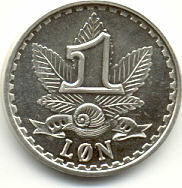 Some NEMO known as HEMP tokens are also believe to be produced around 1985.